The simplest weaving is just up-down-up-down, usually woven horizontally through the vertical strings held on a loom. This basic idea can be altered slightly so that the up-down weaving motion is made through the spaces of a classic granny square. This can be used to create a simple woven wall hanging, as we will see here, or even to make your basic crochet accessories more beautiful; see the example of a woven crochet granny cowl. First, crochet your granny square. Here are instructions if you don't already know how to make the classic granny square. 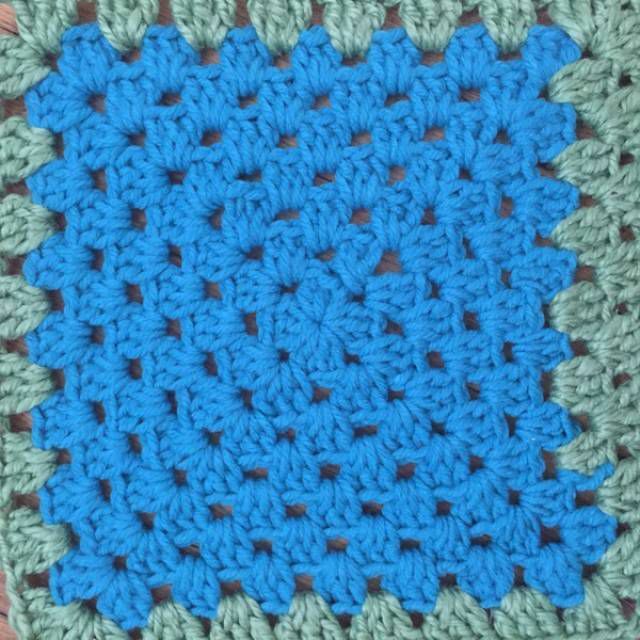 In my example, I've used made an 8 round crochet granny square in blue and green worsted weight yarns. You can make your own granny square any size that you want, using any yarn, and working with one color or many. We will look at different options for yarn below but when you are first starting a simple granny square using worsted weight acrylic or wool yarn is a good choice. And you can make any size, but 5-10 rounds would be ideal for starting out, just so you can get the hang of the process without getting bored. Once your granny square is complete, you are ready to do the weaving. Switch to the yarn that you'll be using for weaving; I used a DK weight yellow acrylic yarn in this example. At this stage, you can choose to cut all of the yarn that you'll need to complete the piece. You'll need as many pieces as there are vertical columns across your granny square (perhaps minus one; see Step 7 for further explanation.) In my case, this meant that I needed 16 pieces of 25" yarn for weaving. Begin in the bottom left corner of the square and weave up to the top, pulling the yarn up through the first chain space, down through the second, etc. Note that you can use a sewing or tapestry needle to do your weaving. However, I found that the yarn was thick enough and the granny square spaces wide enough that I could do this weaving just using my hands. The reason that you're crocheting vertically is because we are going to use the ends of our weaving to create fringe at the bottom of our wall hanging. You could, of course, opt to weave horizontally instead. When you reach the top, you will switch directions, working down into the same line of spaces that you worked up into. If you go over the top of the granny square, bring the yarn back under and through the opening. This secures it. You are always going over-under. The over-under process of weaving that we use here is very similar to the ribbon weaving that is sometimes used in sewing projects. Note that you are weaving just to they right of the yarn you just wove through, in the same chain spaces. However, where you went "over" before, you'll go under now. This creates a staggered strong line of weaving vertically on your square. Knot the two ends of the weaving yarn together at the bottom in a double knot to secure it as fringe at the bottom of your wall hanging. Repeat across, working one strand up and then down into each vertical of your granny square. I used a total of 16 strands for my piece. I opted to cut all of my strands at the same time in Step 2 above so that I could confirm that they were about the same length. Crochet through the center hole. ​Crochet up and down in the spaces above, skipping the center hole by carrying the yarn right across it in your weaving. Either of these options works fine but does throw off the symmetry of the piece, which is why I opted not to crochet in the center vertical at all. There are many different ways that you could manipulate the simple steps in this weaving to alter the outcome of your wall hanging. In my DIY, I've crocheted up and down one time in each vertical across except for the center vertical. In this photo, we see some other examples. The first two show that you can weave vertically up through one column then down through the next column, leaving either the center or end verticals empty to get the right number of up-down. The next two show what we did already in this DIY, except that one shows that you can choose to skip columns rather than weaving in every single column. On the bottom of the image here, we see an option to weave both horizontally and vertically, rather than just vertically, leaving fringe on two corners, which creates an interesting effects. We also see what happens with thicker weaving (three strand) or when you change up the yarn so that the thinner yarn is used for the granny square and the thicker yarn is used for the weaving. In the final example from the set above, we saw what it looked like when we switched to using a thin yarn for the making of the crochet granny square and then a thick yarn to do the weaving. We see a more dramatic example of that in this image, where a DK weight yarn was used for the granny square and a bulky weight yarn was used for the weaving. It's a completely different impact. You really need to play around with different options to find out what you like when it comes to the unique technique of weaving into your crochet. We also see in this example that you can play around with different colors in your weaving. In our wall hanging DIY, we used the same yellow yarn for every strand of the weaving. However, these examples show that simply by adding a second color, your options for creating patterns using the weaving open up dramatically. We see one example where the colors are simply alternated across and another that has a half-and-half triangular pattern. You can do many, many different things when working with additional colors as your weaving yarn. Of course, you can also achieve changes in color with variegated yarn. Here is an example of what that might look like; in this case both of the yarns used (for the weaving as well as for the granny square) are worsted weight yarn and both are variegated. Note: You can see here an example of weaving across the center vertical (which happens to be a horizontal in this case, but the point is the same) where we have skipped over the center hole and made a long line of yarn carried from the space before the hole to the space above it. This was discussed above in Step 7. Here's an additional example showcasing how changing your yarn can significantly change the look of your weaving. In this example, the granny square is made using recycled silk sari yarn and the weaving is done with Red Heart Cordial, which is a braided polyester cord. Once you have mastered the basics of weaving into a granny square, you can let your imagination run wild. Not only can you change the yarn type that you use, as we have already seen, but you can change the shapes that you work with. For example, you could weaving into a granny triangle instead of a square! Or you could weave into a granny rectangle, which is what was done in the granny cowl tutorial. In the example pictured here, we have layered one crochet granny square cockeyed on top of another (creating a diamond shape atop a square) and used weaving to secure the two together with interesting decorative appeal. This example uses Cordial yarn as the weave again, with worsted weight acrylic for each of the granny squares. This tutorial taught you all that you need to know to easily weave yarn through a granny square to create a unique wall hanging. The rest is up to you. Choose your yarn, choose your weaving technique, choose your size and make your own unique project!